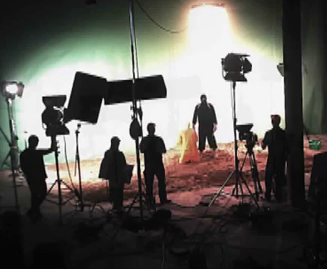 Leaked Video Shows Making of Islamic State “Execution” in Studio — via CyberBerkut Hack of Sen. McCain Staffer islamic–state–studio. Terrorism research expert Veryan Khan said the video of Japanese hostages Kenji Goto and Haruna Yukawa looks like it was completed in an indoor studio with a false backdrop, pointing to the light source on the men that appears to be coming from two different directions — as opposed to one bright sun. LeakSource cannot confirm the video’s authenticity. If it’s a hoax, it’s a pretty elaborate and expensive one. Is it legit? If so, was it done by an Islamic State production crew (unlikely with a female PA on set) , or someone else (ie. intelligence agency). And why was it found on a device of Senator John McCain’s staffer?